Here's the links to the blogs referenced in this episode: Includes notes and tips on what worked and didn't work for me. Combine Crayon Shavings with Wax Paper to make this beautiful creation. Melt your leftover crayons and melt them in a silicone tray to create shaped crayons. Today's episode will surprise you because I get crafty with something you typically toss in the trash - toilet paper rolls. From useful to home decor ideas I found some fun Pins from Pinterest to share with you today. So be sure to check out the TOILET PAPER ROLLS episode on My Craft Channel. Below are the PINS that I reference in today's episode. Create a fun, inexpensive bird feeder with peanut butter and bird seed. Stop ripping your wrapping paper with tape, and create a snug holder with a toilet paper roll and tape. Be sure to join me next week me next week when I show you how to create some colorful art pieces using CRAYONS! This is one of my all time favorite episodes so don't miss it! 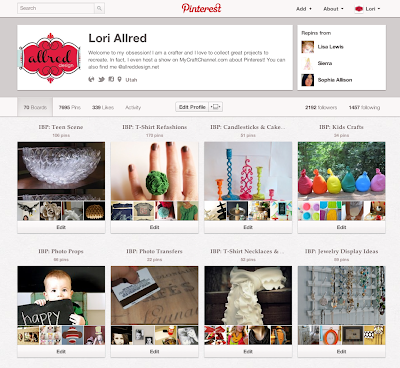 Last night the creators of Pinterest surprised us with a new look to our Pinterest Profile pages. I love how clean it is and that you can have our profile front and center...or actually top and center. I would suggest quickly reading through a blog post a friend sent me from Katja in Sweden. She shares some quick tips on how to update your Pinterest Profile page. Today's episode really was the inspiration and result of my daughter getting caught melting plastic spoons in her bedroom...the smell really caught my attention. I'm glad she tried it though because I was intrigued and had to try it out myself. So be sure to check out the PLASTIC SPOON FLOWERS episode on My Craft Channel. It all started with a cute pin that compared a more expensive t-shirt from Anthropologie to one that was refashioned for a lot less. My issue with Anthropologie, besides the fact I won't spend $68 on a t-shirt is that they don't carry clothing in my size. So how awesome was this that I could take t-shirts that I bought somewhere affordable and jazz them up to look trendy and cute. I have a confession, I have postponed doing this episode for a while now. In fact, I was still making the darn examples late the night before I filmed. Funny thing though, I really like how it all turned out. I was able to show some of the yummy PINS on Pinterest and still show you a couple of very easy techniques. So be sure to check out the T-SHIRT REFASHIONSepisode on My Craft Channel. I wanted to share another "Inspired by Pinterest" find that I actually recreated! 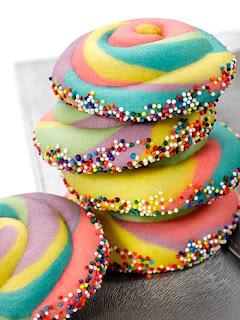 These fun looking rainbow sugar cookies caught my eye one day and I "had" to make them. So I picked up some fun gel food coloring colors (did you know they have aqua?) and sat down yesterday and made up my first batch. But first here's the picture I pinned on Pinterest....yummy right? I opted to omit the sprinkles, but don't they look awesome. They taste great too!! But I also thought I'd share what I learned because the original source blog "told" me how to make them, but since I'm such a visual person I needed step-by-step "pictures." So I took some along the way and thought I'd share what I learn when making these. Step 1: Make sugar cookie dough. I used a great recipe from my friend Amy (I'll add it to the end of the post).